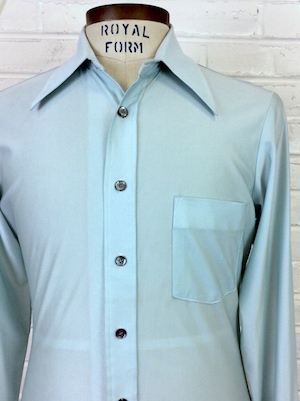 Mens vintage 1970s disco shirt! 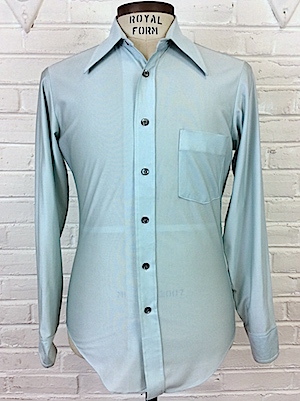 Get your funk on in this super shimmery pale blue disco shirt. Has a super wide & super pointy disco era collar. Closes in the front with pearly gray buttons with one matching button on each cuff. One patch pocket on the chest. Shirt has a straight hem. Tagged by Qiana. 100% Nylon. Condition: Good++. Has some pilling on the front pocket and some small, blue-ish stains on the back of the shirt, toward the center. Still an amazing disco shirt. Priced accordingly.